Where everything seems possible and nothing is what it seems….enter the labyrinth! From the 1986 film Labyrinth comes Sarah and Worm as stylized Pop! Vinyl Figures. 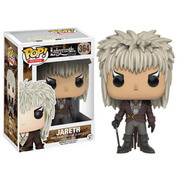 This Labyrinth Sarah Pop! Vinyl Figure measures approximately 3 3/4-inches tall and comed packaged with Worm in a window display box.